ATMOSFERA SVK-A series vacuum solar collectors with 24 mm condensers have successfully passed through regular certification at SP Technical Research Institute of Sweden and received Solar Keymark Certificate under number SP SC1073-17. 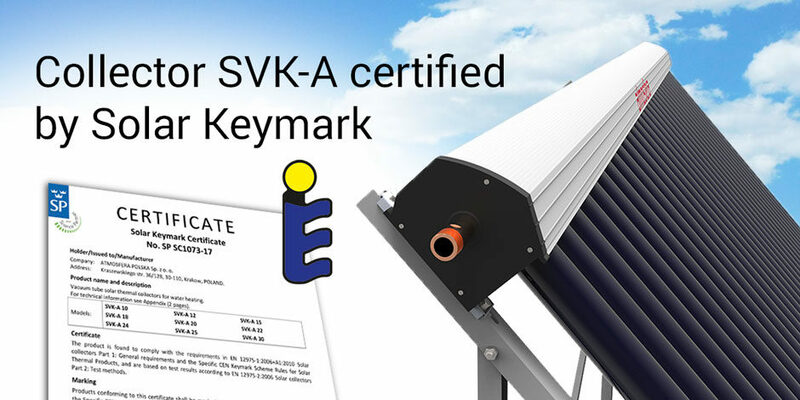 Solar Keymark Certificate is the most authoritative certificate for heat equipment and is acknowledged as the official standard by all establishments in Europe. Collectors SVK-A with 24 mm condensers are manufactured by Atmosfera since 2014. They replaced the previous models with 14 mm condensers. The increase in diameter of condensers, as well as the change in configuration of the main heat exchanger, the innovations in production of heat pipe exchanger have caused to significant improvement in efficiency of collectors that was proved by official tests. * What does K mean? The productivity of collectors is mentioned at temperature difference between the temperature inside collectors and ambient temperature, for example, at temperature of collector as 90°C and ambient temperature of 20°C their difference will be 90°C — 20°C = 70°C or 70K. The performance indicators of SVK-A, received by the certification center, are the ones of the best among collectors of the same class. Due to results of tests the collectors by Atmosfera have exceeded the models of the closest competitors, presented in Ukrainian market. You can assure of it having made your own comparison of certified collectors on the website of certification center.